A while back we published a story about a Catawiki item, a calendar from 1947. We were correct to assume that the cover art was not by Bob De Moor but two of our readers, Chris Mouton and Olivier Marin, pointed out that although the cover was surely not by Bob De Moor the calendar did hold 3 drawings by Bob De Moor inside. Which of course changes everything. 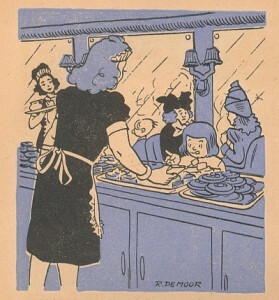 In 1946 Bob De Moor was asked to make 3 drawings to go with a story inside a 1947 youth calendar to be published by the Flemish Ghent based publisher Snoeck-Ducaju & Zoon. Called ‘Snoeck’s Jeugdalmanak’ this (17 x 24 cm) booklet counts 40 pages. The publisher’s name will ring a bell with our Dutch speaking readers as this is indeed the same publisher which has been releasing the popular yearly Snoecks calendar (and this since 1782). One of three drawings featured in this 1947 calendar. The style used for the 3 drawings shows a very talented Bob De Moor at work. On top he uses a clear line style of which many still think he would only develop years later. It suffices to see the waitress he added on the left to know that this was no amateur at work. One point of critique ‘could’ be added. Although the whole looks (and is) very balanced Bob De Moor did not put the stress on the kid (Marietje) but on the waitress in the front. A bit weird since Marietje is one of the main characters in the story told. A small detail and up for discussion of course. This item is very rare to find, if you see it, be sure to pick it up because you’ll probably never get the chance again.